The HoC Is A Court & The Judiciary Have No Place Interfering With Democracy! Before reading Richard North’s posting may I suggest that you read Article 50 (CLICK HERE). Having followed the Court most of yesterday it seems clear to me that the judges have no place in interfering with our democracy and the largest single vote ever in Britain which returned a clear majority vote for #BreXit. It also seems t6hat the judges have not read and understood article 50 and are even now tring to broaden the case to establish whetyher they like the content of ‘The Great Repeal Bill’ which will be presented to Parliament when its terms are finalised and the time is apposite! In public health practice, I occasionally come across what we would call “hysterical vomiting”, sometimes known as “epidemic hysteria“. Invariably seen in girls’ schools, it presented as an outbreak of vomiting and other symptoms, for no apparent reason, for which no medical explanation or evidence could be adduced. Initially rather alarming, and in some ways replicating outbreaks of winter vomiting, these outbreaks would be over as quickly as they erupted with no lasting effect or harm done – testament to the phenomenon of mass hysteria. And in many ways, that is exactly what we were seeing yesterday in the Supreme Court, where so many solicitors and barristers turned up to the proceedings that harassed court administrators had to provide an overspill room, with video links. Does the Government have power to give notice pursuant to Article 50 of the Treaty on European Union of the United Kingdom’s intention to withdraw from the European Union, without an Act of Parliament providing prior authorisation to do so? By way of a reminder, Article 50(1) – as set out by the Court – states that “Any Member State may decide to withdraw from the Union in accordance with its own constitutional requirements”. Nobody is disputing that point. The moment Mrs May was appointed prime minister and said “Brexit means Brexit”, it was very clear that we are leaving the EU. That decision has been taken – the ship has sailed. At issue, therefore, is Article 50(2). 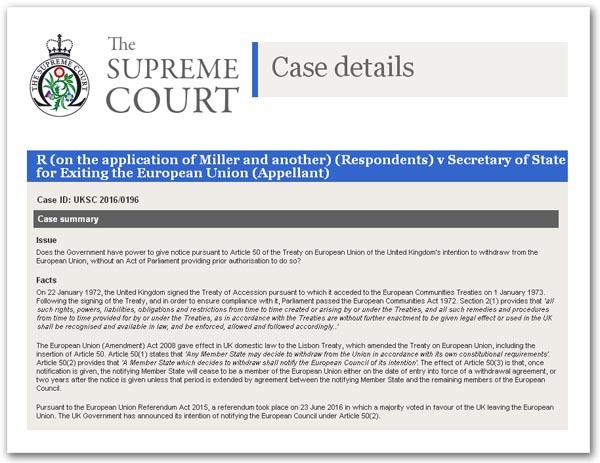 This provides that “A Member State which decides to withdraw shall notify the European Council of its intention”, and the serried ranks of legal talent are now locked in battle over whether the Government can do this all by itself, or whether it needs an Act of Parliament allowing it to do so. But one seriously wonders whether any of the lawyers and all the many other pundits have actually read Article 50(2) in a critical fashion and actually understood what it says. To repeat the provision, it says that: “A Member State which decides to withdraw shall notify the European Council of its intention”. In precise terms, this is an instruction, conveyed via the Treaty of the European Union, to Member States which have decided to leave the Union. It requires of those states that, having decided to leave, they should tell the European Council of their decision. Read it any which way you like. In plain English, it says: “A Member State … shall notify ….”. By any possible interpretation, that is an instruction. There is no other rational way of reading it. As we know, treaty requirements (instructions) are addressed to governments – not parliaments. The governments are the parties of record, representing their respective countries. When it comes to our Parliament, it is sovereign in its own House. No external power cay tell it what to do. In other words, the Government does not rely for its authority to obey the instruction set out in Article 50(2) on Royal prerogative. The instruction is given legal effect by an Act of Parliament, namely the European Communities Act 1972 (as amended). The Government must obey relevant treaty provisions because Parliament tells it that it must. To repeat: Royal prerogative is not involved. On that basis, it is completely otiose that anyone should argue that, in order to invoke Article 50(2), written into an EU treaty as an instruction, now requires an Act of Parliament before the Government can obey it. By the same token any EU directive, each of which bears the legend, “This Directive is addressed to the Member States”, would require an Act of Parliament before the UK Government could transpose it into UK law. As it is, the government relies on the ECA for its authority, as indeed it can and must do in invoking Article 50(2). Then, on a purely practical note, since it is agreed the Government has the right to decide that we should leave the EU – having made that decision without challenge – is anyone seriously suggest that it should not be allowed to tell the European Council of its decision? That is one possible effect of giving the Article 50(2) decision to Parliament. There is no point in it having the power if it cannot exercise it by refusing to notify the Council. We would then be in the absurd position of the Government having decided to leave the EU but not being able, formally, to tell it what it had done. Since the decision to leave would not have changed, the Prime Minister would then, presumably have to write a note to President Tusk saying: “I am no longer going to attend EU meetings, and we’re no longer going to obey your laws, but I’m not allowed to tell you why”. How can it be, one then wonders, that so many High Persons can get it so wrong? But such persons, no more or less than others, are not immune to their own forms of mass hysteria. We should, perhaps, call this variety “judicial hysteria”. Yet, for all that, the President of the Court, David Neuberger, avers that the appeal “is concerned with legal issues and, as judges, our duty is to consider those issues impartially, and to decide the case according to the law”. “This”, he says, “is what we shall do”. It would help if he started by reading it.